Fact: food is best devoured looking out at a jaw-dropping panoramic view. You’ll find sights from the Sky Tower all the way to the harbour and historic ferry building at Vue, an elegant eatery tucked away on the top floor of the Grand Mercure hotel. The restaurant has recently been given a new look that complements the stunning backdrop. 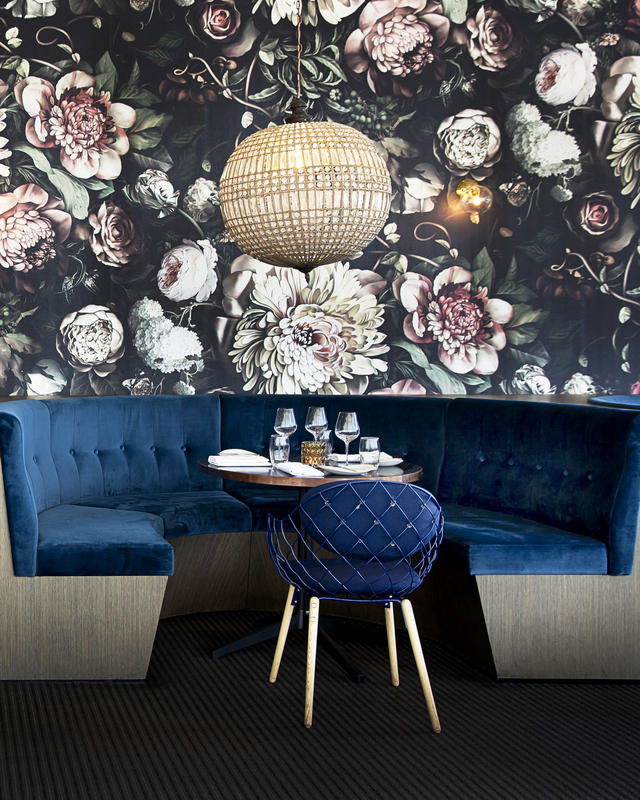 It boasts plush navy velvet booths (with enough seating for any intimate gathering) and grand moody floral wallpaper, the perfect backdrop for any date night ‘Gram. At the helm of the kitchen is Korean-born Executive Chef, Daniel Na. Having joined the team late last year, Na brings with him a wealth of worldly flavours and culinary techniques as the Head Chef at Ostro. Vue’s reimagined menu now offers a curated selection of Asian and South Pacific-inspired sharing dishes. For Na, it’s all about letting the produce speak for itself—we’re talking fresh Akaroa salmon or grass-fed savannah scotch steak. To start, sample local Te Matuku or Te Kouma oysters, sourced from Waiheke and the Coromandel. Next, it’s all about the sharing dishes. 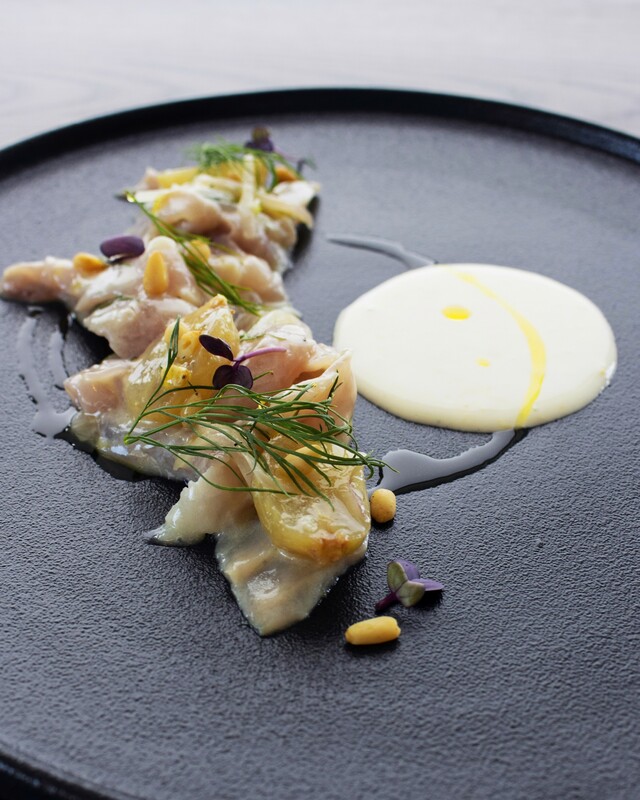 From the sea, we recommend the local fish crudo—an Italian inspired raw dish featuring the catch of the day with grapes and pine nuts, slathered in cultured cream and muscatel vinaigrette. For something on the spicer side, don’t miss the king prawn red curry with chilli, Meyer lemon, and toasted brioche. Premium meat dishes are plentiful at Vue, from wagyu beef tataki through to free range confit chicken. We’re taken by the melt-in-your-mouth slow cooked, free-range pork cheeks paired with sweet carrot, burnt carrot, espresso, and cardamom. But if you’re after an elevated classic, don’t go past their luxury double cheeseburger. It’s a juicy combination of wagyu beef, pickled cucumber, Emmental cheese, and sriracha mayo—perfect when paired with the crispy truffle and parmesan fries. Refresh your taste buds with a sweet treat and share a coconut crème brûlèe complete with a flamed-sugar top—cue the satisfying crack. 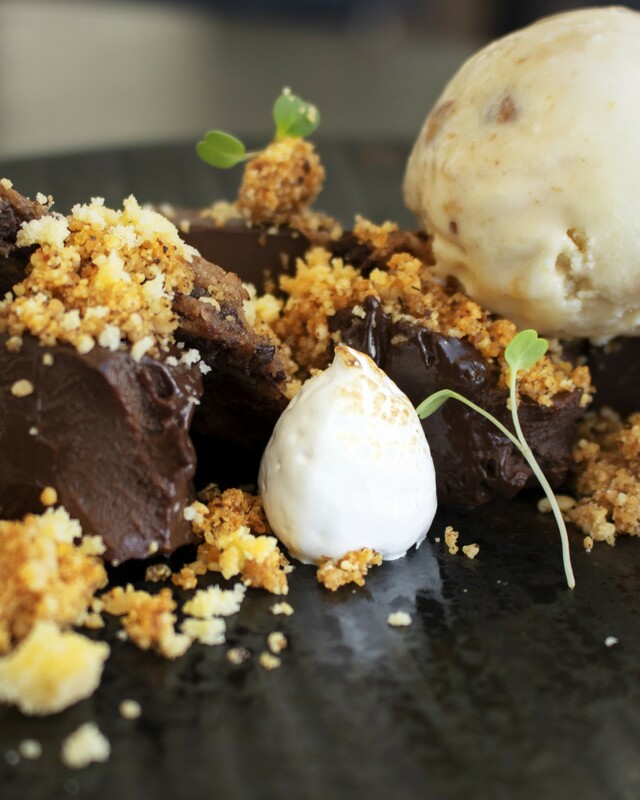 For a modern classic, try this twist on a pave with dark chocolate, hazelnut praline and a side of macadamia ice cream. Quench your thirst with their custom selection of New Zealand-inspired cocktails like the Kai-piora, which blends a unique kiwi and feijoa vodka with lime. In addition to a delectable dinner, Vue also offers indulgent breakfast and lunch options. From six in the morning, you can enjoy a full breakfast buffet featuring buttery pastries, made-to-order eggs and even a make your own juice station. Or enjoy a midweek moment of luxury with their express three-course lunch menu which includes the entrée and dessert of the day with your choice of main. If you’re already drooling, round up your foodie friends and book a luxury booth at Vue for a night of delicious sharing plates and epic Auckland views. Editor’s note: This article is sponsored by Grand Mercure Auckland and proudly endorsed by Urban List. Thank you for supporting the sponsors who make Urban List possible. Click here for more information on our editorial policy.